The Department of Natural Resources is preparing to launch an annual wildlife population survey. Kevin Baskins, spokesman for the DNR, says the 15-day long effort will begin this Saturday, August 1st. Data is collected from 208 routes statewide, each covering about 30 miles. 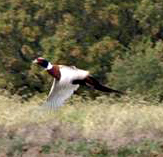 “And that gives us kind of a snapshot of what the populations look like going into the hunting seasons,” Baskins said. A recently released survey of hunters found they harvested an estimated 216,000 pheasants last year, a 30 percent increase compared to 2013. Iowa’s statewide snowfall average was 21.2 inches. The statewide spring rain average was 8.6 inches. According to Baskins, pheasants do best during mild winters with less than 30 inches of snow followed by a warm spring nesting season with less than eight inches of rain. Information from the population survey will be released in mid-September.